Quite a few flocks of birds came into my consciousness in recent years, typically, there are the Red-winged Blackbirds from March to July, chickadees from Nov. to March and the year round Downey Woodpeckers and of course the Robins and Cardinals. 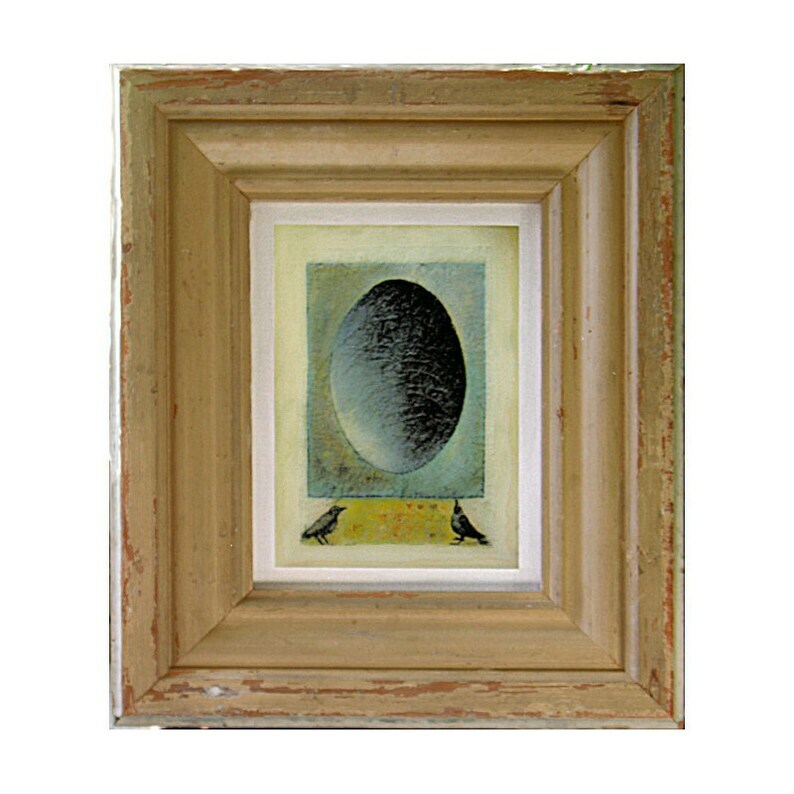 My series - Nest Egg Watching - was inspired by my daily observations/ interactions with these not so "bird brain" creatures. This canvas print is framed in reclaimed antique wood moulding, mounted in shadow box style without mat or glass. Signed & dated on the back. Free Shipping to US, Canada, The Netherlands & UK only, buyers from elsewhere are welcome to contact us for exact shipping quotes based on your location. Please note that computer monitors can shift colours and what you see on your screen might have slight variances from the print you receive. Watermark on the web image only. Peylu © all rights reserved, copyright non-transferable with sale. It shipped extremely fast & it's really well painted and adorable! Lovely little painting, packed carefully to arrive safely. Thank you so much! We are offering a customer appreciation rebate of 5% on your total purchase, when your payment is VIA PAYPAL - please note, the rebate does not pertain to the cost of shipping. If you are unhappy for any reason you may return your purchase in original condition and packaging within 7 days for a full refund. You are responsible for return shipping charges. We only ship to confirmed Paypal addresses, buyers are responsible for return shipping costs for any items returned undeliverable as a result of incorrect or incomplete paypal addresses. Regular first class air mail does not include tracking, it is only available via registered letter post, please let us know if you wish to include this feature so we can provide you with the correct shipping cost. All shipments within Canada include Delivery Confirmation by Canada Post. We will refund shipping difference of any amount over $1 to the purchaser via Paypal. Local pick up may be pre-arranged - please contact us to confirm prior to making your purchase. as parcel rather letter post from Canada. We ship via Canada Post regular air mail, which does not include tracking, unless noted otherwise, Please specify prior to purchase if you require tracking as the shipping cost will differ. The International shipping cost is an estimate based on the farthest destination from us, we will refund shipping difference of any amount over $1 to the purchaser via Paypal. Feel free to contact us for a shipping quote based on your location prior to purchase. International orders are sent via Canada Post International Air, without tracking and liability coverage. Please specify prior to purchase if you require tracking as the shipping cost will differ. we will send you an email notice once your parcel is dropped off at the post office. Please keep in mind that shipping boxes and protective/packaging materials all contribute to the shipping cost of an item. We use clean and recycled packing materials whenever possible - this enables us to be economical and avoid passing on any additional costs related to packaging. All items are carefully and securely packaged with image documentation available upon request. We cannot accept responsibility for loss or damage during transit and recommend shipping with insurance, particularly for delicate items. All Customs charges, taxes or duties due on delivery of a purchase are the responsibility of the buyer and are not included in our shipping costs. In addition we have no control over any shipping delays due to US Customs. Custom request - a surcharge of $10.00 and up image development may apply.